Get Top Dollar Trade-in Value for your old Smartphone Bad Day for the Media – Islam behind Boston Marathon bombing after all? A few months back, one of my updates suggested CEL and AMRN as short term/medium term investments. In the case of CEL, the market had overreacted to new competition in the Israeli market and investors with our suggested timing were repaid with an approximate 69% return. In Amarin’s case (Amarin Corporation Plc, NASDAQ: AMRN), though the stock continued to rise after our endorsement, and providing a 30% return shorty thereafter, I suggested holding on to this position still further. Since Amarin’s announcement to “Go it Alone” in launching their Marine indication for Vascepa, and continuous FDA delays in reaching a regulatory exclusivity decision (NCE), Amarin has continued to lose value; now well below our suggested entry point. Some decrease, based on the the uncertainty of smaller companies launching new drugs successively and lack of acquisition or marketing partner (did they know something we did not? or was the CEO simply holding for too high a bid?) was quite logical. In fact, merger speculation had largely helped fuel Amarin’s rapid increase in share price. Though management so far seems to have been more than competent in achieving their goals and milestones they did fail miserably during this period of rapid share value loss in communicating with their investors. This gave fuel to skeptics and evaporated investor confidence. Management may or may not have good strategic reasons for this lack of transparency and perhaps simply are focused on the tasks at hand and had little care for the stock price in the period before the launch. They know ultimately, that partnership, merger or sales performance will decide the price per share. Having sold their unwanted shares and options at the post-approval highs, and not intending to sell any more in the near term, the retail investor and his current share price may not be a top priority for them. This is not necessarily proper behavior, but may or may not be a factor in explaining the company’s behavior recently. The seemingly inept handling of this interim period, leading to large share value losses, is the subject of a previous post. In any event, as mentioned, some of the value erosion was logical, due to uncertainty in independent drug launches, lack of big Pharma involvement, FDA indecision, and exasperated by management’s odd silence. However, part of that uncertainty should have been laid to rest after the two most recent milestones were achieved as promised. The long awaited Anchor indication was submitted to the FDA (expected approval date in late 2013), and the drug was launched as promised. Rumors of blocked script data circulated (indicated a management scared of sales results) and further eroded confidence No such block ever materialized and early script data has been readily available. Furthermore management released quarterly earnings which were not expected to show anything new (Vascepa did not launch until the last three days of the quarter). The market has unexplainably continued to rock Amarin further since its launch, despite freely available and rapidly increasing script sale figures, an ever impressive patent situation, and management meeting the crucial Anchor submission. Amarin dropped sharply after the Earnings call, as if some magical phrases were missing from it. If anything, the report showed an impressive number of sales totaling $140,000 for the quarter. This figure represents a much higher number of scripts than those reported by IMS for that last week of the quarter. Nothing too serious should be read into that figure, it could include pre-stocking, or accounting estimates by Amarin but it certainly did not warrant a 7% price drop. Therefore, though the market seems to have heavily undervalued Amarin lately, and at the time of writing, shares were in the mid to high 7s, I retain the position that patient investors will reap the rewards of an Amarin investment, especially any entering at these low prices. I would expect for this trend to shortly start reversing back towards 9 as further sales data comes in. The recent weakness seems to have much to do with “modest” early script sales. It is possible that many investors, with the Lovaza billions in their minds, were shocked to find early weekly script data in the 2 and 3 digits. I believe this has led to confusion and the sell-off, hence an undervaluation. It is important to note that early weekly script data provided by companies such as IMS are very rough estimates. They cannot and do not capture every script filled, but rather use sampling and projections. These can be especially inaccurate in these early periods of a launch as the data is too sparse. Furthermore, accurate or not, the first weekly of script data of a new launch especially one not from big pharma, is hardly useful. It simply is just not meaningful information; a drug can be a blockbuster success or a miserable failure and have the exact same early script data as Vascepa has reported so far. In the Vascepa launch, there are additional factors that make early script data especially meaningless. Amarin reportedly gave out many samples in order to introduce Vascepa to the market. These 5,000 monthly samples, given to high prescribing doctors, do not show up in the Rx script data nor as sales in quarterly earnings. On the contrary, they are merely expenses. Only as those 5,000 (or more) samples run out, will the evidence start to show whether these are turning into paying customers or not. Amarin is still tier 3 under most insurance programs, making the drug more expensive to customers and harder to prescribe for doctors. This is normal for a launch, and Amarin’s management has made it a top priority to migrate Vascepa to tier 2 pricing. Although the company has instituted coupons to mitigate this initial tier 3 pricing problem, this is not the same nor as nearly efficient (not to mention profitable) as being wide acceptance in tier 2. The long term value of the company is built around the Anchor indication, and perhaps even the Reduce-IT study. The marine indication currently launched is small potatoes relative to what can be accomplished around the Anchor indication due late this year. While Lovaza’s impressive numbers are achieved with an indication targeting only the Marine’s target population, Vascepa’s Anchor indication targets a population 10 times larger. Despite the above, investors are having trouble visualizing the cash flows expected compared to the early Rx data. Let us illustrate this further. Script sales from drugs such as Vascepa can grow exponentially due to prescription refills. Vascepa is not a 1 week antibiotic or similar. It is a relatively long term prescription. A weekly report of 500 new scripts indicates 500 new customers. These customers are likely to be refilling next month, in addition to the new 500 customers that are added that same week (and every week, assuming a consistent rate of sales). For the complete 2013 calendar year, Bloomberg quoted the consensus nine analysts as $114 million. Let us analyze and project some numbers. Again, it must be stressed that everything about them is inaccurate and in essence meaningless since we do not know so many parameters about the launch, we don’t know how many have truly been sold, how many given as free samples, how many stocked, how well will the copay coupon program be received, if and when Vascepa will be migrated to tier 2, and host of other critical variables. The point is to simply model weekly script sales to cash flows. The above numbers, and the earnings call sent the stock tumbling. However, as meaningless as they are due to their premature and incomplete state for analysis, ironically the only thing that can be observed within them is very rapid growth and acceleration. In addition, the earnings report indicated $140,000 in sales which indicates about triple what the Rx data showed. Overall, it may be that the script data in general is quite underestimated at this point. Time will tell. In any event, additional weekly script data showed the following weeks to be 627 and 838 respectively. Again, these are not necessarily accurate, IMS Health and Symphony health for example have reported different numbers (though not drastically different) each week. These do nothing but continue to show consistent growth. Running total sales for Vascepa assuming 10% increase in weekly scripts and 50% refill rate. The 10% increase assumed in new weekly script sales is modest, due to the factors already explained above, that the current growth rate has been far higher, and the fact that the initial numbers were likely under-reported as well. However in this scenario we see that though 1st quarter sales are below the consensus estimates at $2.74 million (compared to $5-$10 million), when extended for the rest of the year, total sales for 2013 come in at about $200 million (nearly double the consensus estimate for the year). Furthermore, the steady 10% weekly increase (plus 50% retention rate) ends up at around 100 thousand total scripts per week by the end of the year, right about what Lovaza currently is selling per week. In reality, a 10% increase in new scripts per week is likely too small for the first quarter, and too high for the later parts of the year. For a perhaps more educated projection, we can increase weekly scripts faster earlier on, and then steadily level off as the year goes on. We will also assume a 70% retention (refill rate) for this first year (meaning 30% of patients drop out of use each time they must refill. Easily enough, this modest growth and retention reaches the first Quarter lower end estimate ($5 million) and gets to the consensus estimate of $114 million for the year. Still, merely a tenth of what Lovaza sales are at annually. In the above model, weekly script sales increase more rapidly at first, peak at 7,500 new scripts for 1 week, and then steadily decrease down to 5,000 new scripts per week. Obviously, many other rates of increase and decrease, as well as refill rates can be played with. By no means is this projection meant to be accurate, in fact it is not really a projection by any means, but merely a model to show that the current script data available in the Vascepa launch is far from a disaster; it is in fact slightly indicative of good news due to the steady acceleration of prescriptions, and mostly simply too little data and too early to be of any real meaningful value. In reality, I do not expect weekly sales to follow any such pattern, they will be much more volatile as different milestones and strategies are unveiled by the company. Sample prescriptions are slowly running out, those switching from Lovaza also must finish existing stock, the sales team is improving their coverage while doctors are waiting for their patient’s regular visits. All of this takes time, especially from an independent launch such as that of Vascepa by Amarin without big Pharma’s big guns. Reaching tier 2 with major insurers will have large effects (albeit of course lagged as well), as will Amarin’s marketing campaigns. The initial launch focused on high prescribing doctors almost exclusively; later stages will include not only reaching out to a broader spectrum of doctors but perhaps most importantly direct to consumer advertising. At the end of the day, nothing can drive sales as much as consumer demand, since they more than anything else can inform and steer their doctor’s behavior. In order to use these advertising dollars intelligently and efficiently, being covered under tier 2 pricing in a large part of the market would well advised. Therefore, the market’s panic due to early script data is unwarranted. Another, more logical, fear in the market seems to be based around exclusivity. There are two parts to this fear. Firstly, the absence of an FDA decision on regulatory exclusivity for Vascepa and thus lack of NCE consideration (thus far). Secondly, vaguely expressed fears surrounding generics and the fact that Vascepa is at the end of the day, simply purified “fish oil”. The first concern is not really relevant to the low share price currently in the market. While I do not want to discount the importance of NCE for Vascepa, and it should certainly affect the pricing (for example in terms of an acquisition), either a “Yes” or a “No” on NCE leaves Amarin currently highly undervalued. The bottom line is that the difference between these two outcomes, details aside, is a regulatory exclusivity of 3 years, or one of 5 years. Though the difference is important for confidence, and to make sure litigation costs are kept at zero for a longer period (patent protection can be challenged in courts) neither one can break (or make) Amarin. Lovaza’s NCE protection has long expired without any noticeable effect. On the contrary, sales continued to increase rapidly, and it is Lovaza’s patents that have held up. In May of last year, Pornova (who owns Lovaza’s patents) won a court decision against Teva Pharmaceuticals barring them from issuing generics (perhaps why Teva is or was interested in acquiring Amarin). On the other hand, Generics are expected as soon as 2015 (if not sooner) for Lovaza due to an agreement with Pornova. Lovaza’s ‘667 patent expires in April 2017 and the ‘077 patent expires this month (March 2013). NCE protection is in fact meant for drugs without a patent protection (or at least not a strong patent protection). This regulatory short-lived exclusivity helps make the costs of new drug development and FDA approval worthwhile. True long term protection however, can only be afforded by patents, and other free market barriers to entry (start-up costs, trade secrets, supply, etc). Lovaza had a very modest patent portfolio, that nonetheless served it well, compared to Vascepa’s 18 patents in the bag and 30 additional pending with expiration as late as 2030. When again, one measures that the NCE decision is not one of regulatory exclusivity versus none, but rather one of 3 years versus one of 5 years that Vascepa is facing, the NCE issue is really not very important either way. The second concern is more involved, and it derives from a general fear of lack of protection and exclusivity regardless of NCE and patents, due to the fact that Vascepa is “fish oil”. On the face of it, there is more teeth to this argument, but in order to be financially accurate, we must be more exact. Whether Vascepa is “fish oil” or not, is best left for the philosophers; it doesn’t matter. This is not theory, one can witness its reality in the case of Lovaza. Lovaza, 38% DHA, 47% EPA, and 17% other fish oils in the form of ethyl ester is as much fish oil if not more so than Vascepa. This has not stopped it from selling $1 billion annually. Vascepa on the other hand is highly purified EPA (96% +). This certainly sets it further apart from “fish oil” than its competitor. Fish do not actually produce EPA but actually obtain it from marine algae in their diet, but I digress. Many drugs are derived from herbs, plants, algae and other organic life. This in itself is irrelevant. It could even be true that the same or many of Vascepa’s benefits can be obtained by a diet in seafood and/or over the counter omega 3 supplements. That also really does not matter. Vitamin A is readily available in apples, and Vitamin C in Oranges but that does not stop supplements from being widely sold. So what does matter? The FDA approved indication. In our regulation obsessed modern society, approvals, certificates, patents and licences are what matter. When in a courtroom, there are many people who could perhaps argue a case exceedingly well, those who could look up the relevant law and make a much more intelligent and passionate argument, but alas only those who passed the BAR Exam allowed to practice by the State (attorneys) can be hired. Our recent financial crisis, was in large part produced (besides by government housing policy), by those pesky triple A ratings the quasi-regulatory rating agencies provided for all the exotic RMBs backed CDOs, synthetic CDOs and CDO squared securities. With them, trillions of dollars could be “safely” invested in them by pension funds, municipalities, insurance companies, institutional investors and the like while without them, the funds would quickly dry out. Undoubtedly, highly purified EPA such as in Vascepa and simply eating fish are different. Even over the counter supplements and Vascepa are significantly different for various reasons, but financially speaking the real difference lies in the indication. There is no salmon, nor over the counter supplement that a doctor can point to and say “the FDA says this WILL reduce triglycerides and not raise LDL-C, x and y, while not causing a, b and c side effects”. They do have an indication they can point to that will do slightly worse, and it is called Lovaza, and due to this fact it is a billion dollar market. An FDA approval is difficult, expensive and an extremely lengthy process. Likewise, once obtained, it is highly valuable. At least in the short term (a few years), a drug does what the FDA says it does. This leads to the second part of the problem; expert articles on the matter have not differentiated between the different types of exclusivity dangers. It is true that Amarin does not own nor can it own EPA, nor fish oil. But that is also besides the point. What patents and regulatory exclusivity are foremost trying to block is “Generics”. Generics does not mean an over the counter EPA supplement, nor the local farmer’s market selling you mackerel but rather a generic (non brand name or different brand name) version of the identical drug. Again, theory is not needed, Lovaza (out in some form or another since 2006 or 2004) is a perfect example; to date no generics have competed against it. The markets are full of fish, fish oil and omega 3 supplements, but Lovaza has had no generic competition to date. This is because its patents (long after its NCE exclusivity expired) have held. A patient can get a salmon, but cannot get a generic of Lovaza; not yet. In similar fashion, one can explore an issue that the pundits have ignored. Though there are no generics of Lovaza yet, notice that Amarin is able to commercialize Vascepa; an even better version of Lovaza. What happened to Lovaza’s patents? As far as I can tell, neither Lovaza’s NCE nor patents could have stopped Amarin. Again, EPA-E, DHA and fish oils are not to be owned. It is the process of purification, synthesis and exact dosage and encapsulation that is patented. More than anything, it is that exact product, that is put through the rigorous, expensive and lengthy FDA approval process. Amarin could develop Vascepa because it was a better version of Lovaza, but not the same one. Could someone come along and make a better version of Amarin if not a generic? Short answer: Sure. But in reality, not quite so simple. As far as purifying EPA Vascepa has pretty much reached the limit. There is hardly room for another drug that is simply 99% pure EPA. So whereas Lovaza left this room for improvement, Vascepa has done so much less. Furthermore, the process patents, trade secrets, purification methods, and supply exclusivity have left it very difficult for any other drug to attempt such a feat. Supply is quite important in this specific business, and Amarin’s patent portfolio is impressive indeed. Different drugs (fish oil based or otherwise) to lower triglycerides can (and most likely will) be developed. But where are they? Where are the FDA trials? Where are the submitted applications, and processes? These take years to complete. Once again, philosophy aside, it is the FDA approval and indication that holds the value, as Lovaza has quite aptly showed. Amarin does not need to sell Vascepa for the next 20 years in order to be undervalued currently, sales for the next 3 years alone suffice to prove it currently undervalued. Many of the arguments made against Vascepa are made without testing those very same arguments against Lovaza. Lovaza had big pharma behind it? Yes, at some point it did, and it certainly helped sales. That is an argument of why big pharma will eventually acquire Amarin, since those numbers are there for the taking with the right support (that they themselves can provide). Eventually, Amain needs them as much or more than they need Amarin, and so it is only a matter of time until bid and ask price meet. Of course, execution is everything, and the right (or wrong) management can botch any business and any drug launch, but fundamentally there is nothing wrong with Vascepa. It’s not icosapent ethyl, it’s not ultra pure omega-3 fatty acid, it’s not fish oil, it’s what the FDA says it is – stuff to treat hypertriglyceridemia without raising LDL-C. The article mentions the mismanagement regarding transparency in the last few months. I personally believe it wasn’t mismanagement by any means, but rather a quiet period when in talks with various big pharma suitors. When those talks didn’t meet their asking price, they launched per their plan and have been following their plan to perfection so far on this route. It may not have been their preferred route, but they had the plan in place to take this direction if needed, and have shown the complete ability to execute it. Yes the data released on Monday morning was not included because the article was written last week, while Amarin’s stock price was well below 8 and before its recent nice upswing. Some forces in the market came to realize the trend I attempted to explain after Monday’s release. Though once again, I did not mean the data to be any form of true projection, the released data was strikingly close, my table had 1014 to Monday’s 1017 scripts. Not bad. It depends how you count the weeks of course, since there has been some discrepancy in the public reporting as to what constituted “week #1” but no matter; the goal was to show was that the consensus sale forecasts for the year were easily possible (though by no means assured), and even more. The market, due to some below par reporting which quite unimaginatively made light of the early script data, seemed panicky about sales and cash flows. Amarin’s management in their typical silence about these quantitative issues (in an effort to be conservative, professional or strategic which is fair enough) was not calming doing much to calm these fears. The article was an attempt to do so; and not necessarily predicting Amarin’s success but showing that predicting its demise based on the early script data was foolish. Indeed, Monday’s data seems to have gone a long way in calming these fears and restoring confidence in some of the investor public, but I suggested this prior… it is to the article’s credit and not a fault that Monday’s data was not included, that is a testament to its authorship date and my inability to release official script data before it comes out. As far as your point that Q1 sales will fall below the forecast, I agree that it looks likely though far from certain. Likewise agree that the year forecast does not at this point look in danger and that Amarin may just be just fine in the long run as you say. Congratulations on on your successful swing trade, for those adept enough, Amarin has been and continues to be an excellent stock to enter, exit and re-enter in the now seemingly predictable mood swings of the market (based around first merger speculation, FDA approval, self commercialization decision and later volume, NCE dates, patents, silence, weekly script data etc). For those less able or willing to try to time the market, I suggest to continue a long (or downside protected long) position at this point. Great article but something is off on your weeklies. We went from 838 to 1014 . You said your estimate was right on when in fact you had 922 so the growth rate is already doubling your estimate early on. This monday i expect around 1400 script to your estimate of 1014.. You have your weeks off. Going back over this, and it’s still a good read. Pat on the back for you! Very good numbers. However now that we have more data, it seems as if models like this aren’t getting new scripts versus renewals right. In short, confusion over renewals versus refills, perhaps. For example, last week (Symphony data) there were 2415 total scripts, of which 1857 were new (so, a difference of 558). 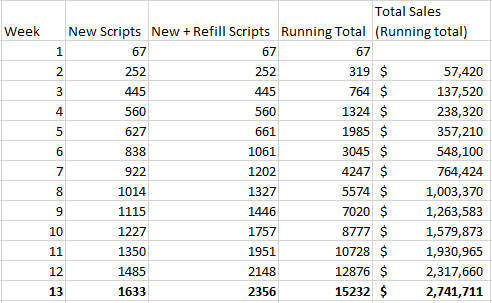 4 weeks ago there were 1468 new scripts — if the 558 number is basic refills, that’s only a 38% refill rate! I am thinking that if someone leaves the doctor’s office with a regular 30 day script plus a few refills, those refills aren’t included in the reported numbers. If, for example, half the people leave the doctor’s office with 30 day scripts and half leave with 30 days scripts + 2 refills (that we don’t see in the reported numbers), then you actual have to go back 60 days — not 4 weeks — to get at what percentage of patients re-up. In this most recent case, then, you’d have to take the 558 number / 620 scripts (week ending 2/15)… that’d give you a 90% refill rate. Seems very high, but we do know they had good compliance in ANCHOR — no or very few unpleasant side effects — so I’d like to think 90% is closer than 38%. We’ll see how it pans out over the next month or two. It gives us a good shot at getting >100mil in revenues w/ 10% script growth for q2, 7.5% for q3, and 5% for q4. The launch, at least the beginning of it, has gone a lot slower than most people have anticipated. This probably makes sense considering the small salesforce. The growth has not been explosive, but it has managed to grow every week as we have yet to see a decline wow (I guarantee we will at some point…probably soon). It is entirely possible that we could see some exponential growth in the near term as doctors start to see the results and have more confidence using the product. The great thing about pharma sales is that once you’ve sold the doctor, they sell it for you thereafter. We’ll see. I hope to get a lot more clarity on the CC this week.